Krazy Deal Daze Turns One!! One year and Counting and many more to come! We cannot believe it has been one year already, time certainly does fly when you're having fun! Just five days ago a memory popped up on my Facebook regarding a post that I had made the previous year that summed up to, "an idea had been had and a decision had been made." It was one of those dreaded vague posts that everyone hates because I kept the juicy details to myself and told everyone to "stay tuned"...lol! Then five days later Krazy Deal Daze was launched! Here are just a few milestones that we were excited to reach in our first year! Just three months after we launched, we were successfully establishing affiliate partnerships with top companies like Amazon , Best Buy, Dollar Tree, WalMart...etc. In our tenth month, we were contacted by a company for what would be our first sponsored review. As we hit our one year mark, we've reached over twelve thousand page views on our site. 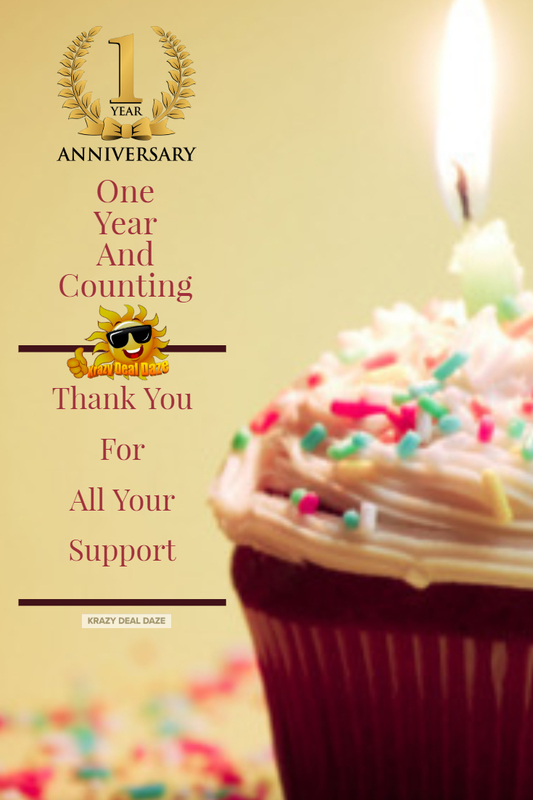 As we celebrate the completion of our first year we would like to take a moment to thank our family and friends, partners, clients, followers, subscribers, networkers and readers for all your support this past year. Thanks to each of you we have exceeded our own expectations for this year. We have already accomplished so many milestones and are looking forward to accomplishing many more in the coming year. We've established some pretty great relationships already and we look for to strengthening them even further as we continue on this Krazy journey. Our sincerest gratitude goes out to each and every one of you for your support in Krazy Deal Daze latest milestone! 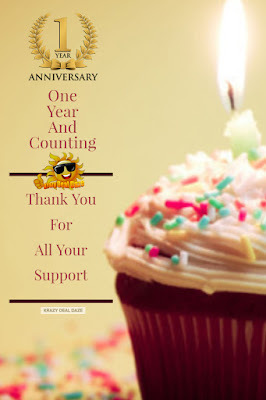 Thank you for stopping by and helping us celebrate our one year anniversary! What do you like the most about Krazy Deal Daze? What was your favorite Krazy Deal Daze post this year? Do you have anything you would like to see us post? Be sure to let us know in the comments below! Congrats! Your work is wonderful! Can't believe you only do it for a year! Congrats on the milestone! It looks like you guys have made some great progress and it's inspiring for us new bloggers! What an amazing journey. Cheers to more success and best of luck to your blogging business! all the very best. Its your hard work that is paying. Keep doing dgood work peoplelike you inspire. Congratulations! May you have many more successful years as you go from strength to strength. Takes a lot of hard work and determination, so you totally deserve the success! Big congratulations. Well done on all you have achieved. Definitely a milestone worth celebrating. Starting a new business is always a huge task but when you accomplish and build on a business it gives immense satisfaction. I am, so happy that you guys are celebrating a successful year along with your customers. Congratulations and wishing you many more such wonderful year coming your way in future. Heartiest Congratulations on your on year anniversary. We wish you love luck and a million more posts! Happy 1st Anniversary! Your work is very inspiring and thank you so much for great updates! Wish you an amazing weekend! 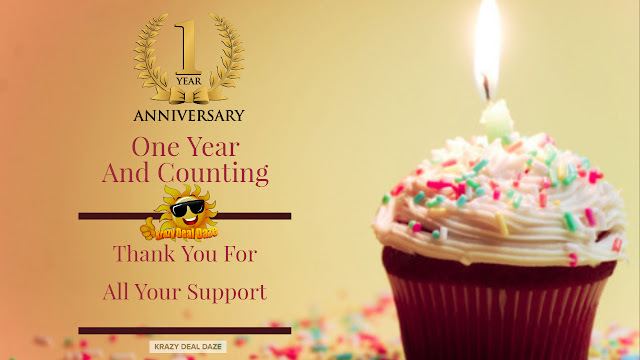 Happy One Year Anniversary to Krazy Deal Daze! Your accomplishments are no doubt well deserved! Happy one year! And thanks for the great deals! A massive congrats on your first anniversary, you have come so far and still have an amazing journey ahead of you.